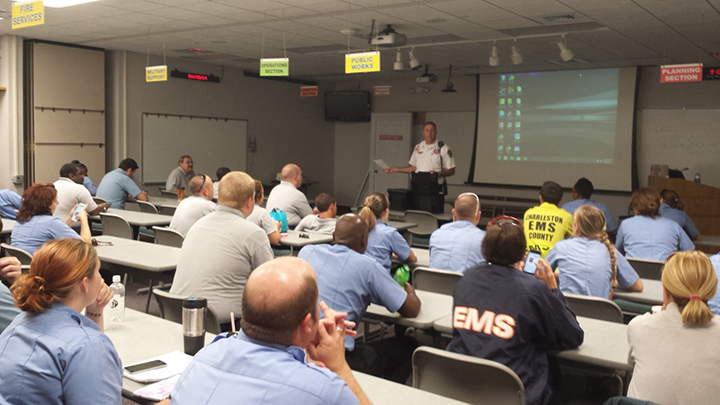 All Charleston County EMS field employees are certified by SC DHEC and NREMT as a Paramedic, Advanced EMT, or EMT. Charleston County EMS does not provide this initial training, but there are several schools in our area that offer EMT and/or Paramedic education. If you are not currently certified as an EMT or Paramedic please contact these schools directly for more information. This course is offered by Trident Technical College and Lowcountry Regional EMS Council several times throughout the year. A candidate must be at least 18 years old by the completion of the course and have a high school diploma or GED. Classes are usually held twice a week at night, from 6pm to 10pm. Contact Trident Technical College or Lowcountry Regional EMS Council for more information about certificate EMT programs. Trident Technical College offers an Associate Degree program for completing your paramedic certification. Lowcountry Regional EMS Council offers a paramedic certificate program for those already certified as an emergency medical technician (EMT). Charleston County offers a comprehensive Continuing Education Program (CEP) that meets and exceeds current SC DHEC and NREMT NCCP requirements. All certified employees are required to attend monthly training and are paid for this time. The Training Division also offers additional courses and training opportunities such as PEPP, PALS, ITLS, PHTLS, TECC at no cost to the employee. Reciprocity for out of state applicants is available from the South Carolina Department of Health and Environmental Control (SC DHEC) provided the applicant has current National Registry certification with at least six months remaining on the certification. All applicants requesting reciprocity must show proof that their certification training meets South Carolina minimum standards. Charleston County EMS does not recognize "Provisional" status certifications.